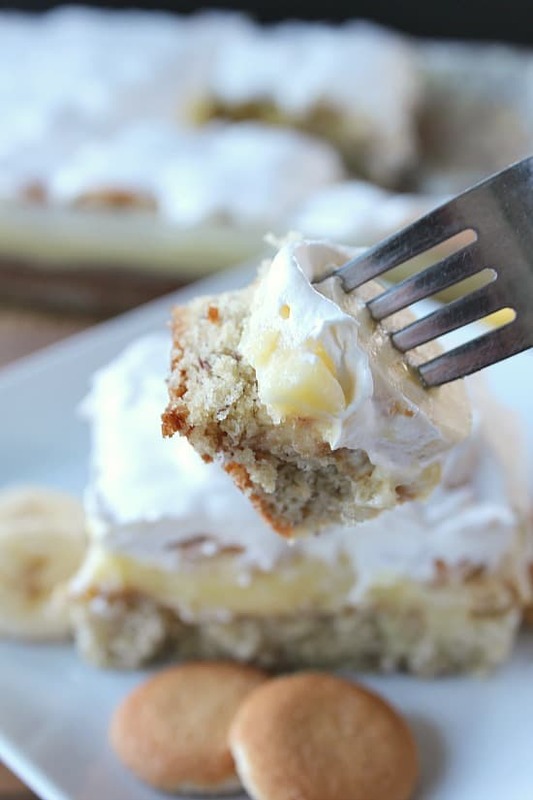 Who doesn’t love a delicious banana cake loaded with banana pudding, topped with sliced bananas, vanilla wafers and whip topping? 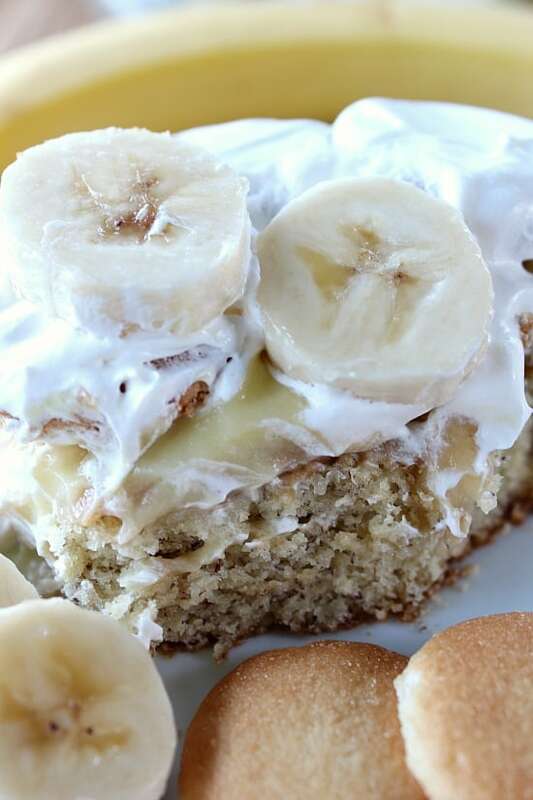 If you are like us, you will want to make the delicious banana poke cake immediately! Love, love, love this cake. It’s not the prettiest cake but let me tell you this, looks are deceiving because this is to die for. Even though it is a bit a messy looking, the taste is overwhelmingly delicious. The ladies at work were going crazy over this banana poke cake. I also brought in an orange cream cheese pie and that was a huge hit too! My food tasters are the best, love them to pieces. If you are going to eat this cake immediately, I would crumble up the vanilla wafer and sprinkle over the top before adding the whip topping. That way the wafers stay crunchy and it’s easier to cut the cake. If you are making it to serve the next day, using the whole wafer is fine. 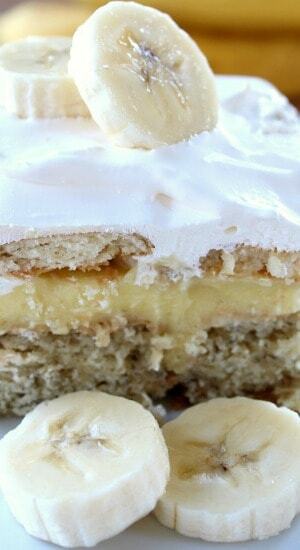 Fresh homemade banana cake, topped with delicious banana pudding, sliced bananas, then loaded with vanilla wafers, oh man, heaven on a plate! That is how I would describe this banana poke cake. Anything banana is always a hit in our house. 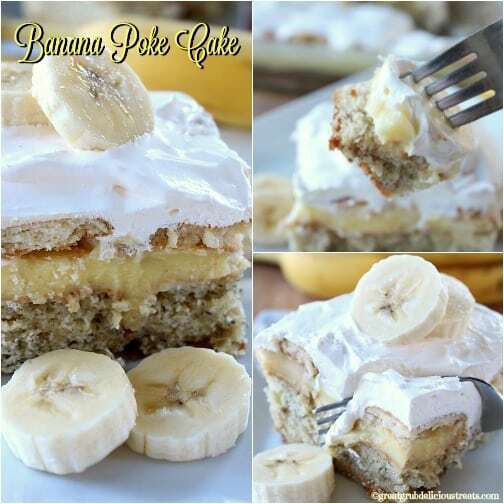 This banana poke cake is a great to take to a potluck or get together. Everyone will love it! Preheat oven to 350°, spray a 13 x 9 baking dish with a non stick spray. Set aside. In a medium mixing bowl, whisk together flour, baking soda, baking powder, salt and sugar. Add butter. Mix on low speed. Pour buttermilk into dry mixture. Add mashed bananas. Continue to mix on low speed for 3 minutes until mixture is creamy. Add eggs, mixing after each egg. Bake for 30-35 minutes or until tooth pick inserted comes out clean. Poke holes all over top of cake with end of wooden spoon. Let cake cool before covering cake with pudding. Once cake has cooled, beat pudding mix and milk in a medium mixing bowl for 2 minutes. Pour pudding over cake right after mixing covering the cake completely (the longer the pudding sets up, the harder it is to get down into the holes). 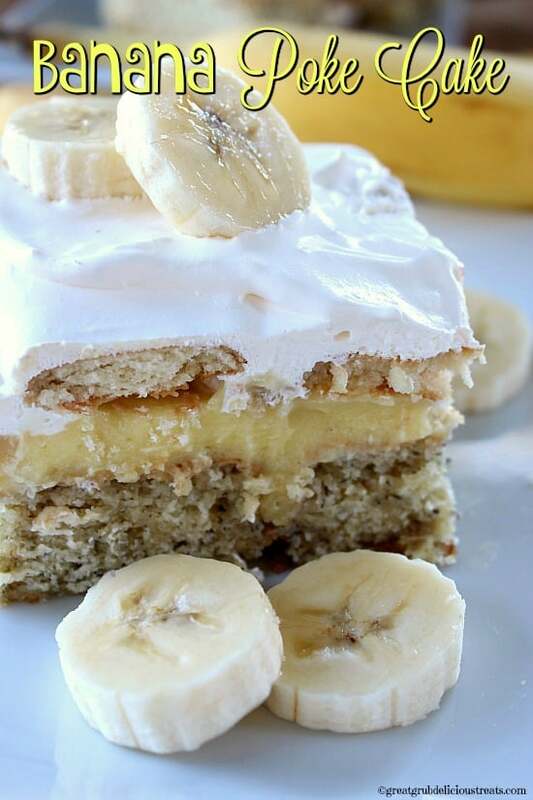 Add a layer of sliced bananas over pudding. Next, add a layer of vanilla wafers. Gently cover with plastic wrap. Refrigerate over night. 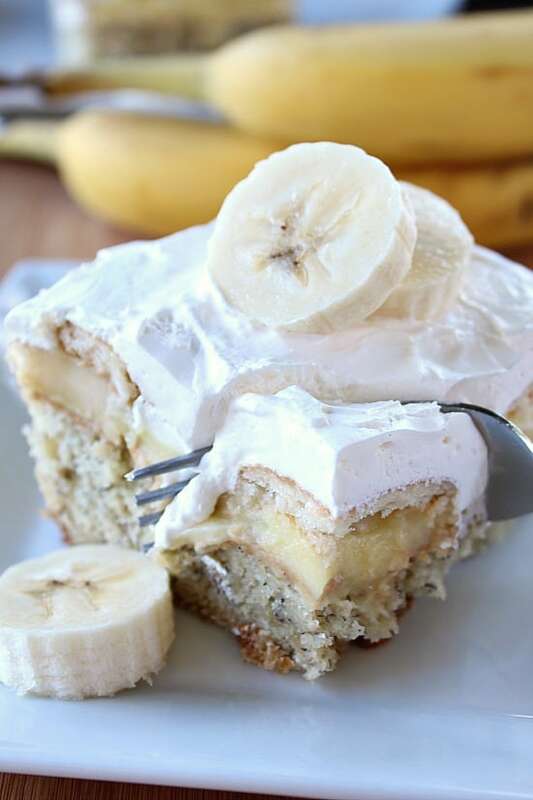 Optional, when ready to serve, slice additional banana and place on each piece of cake with vanilla wafers. 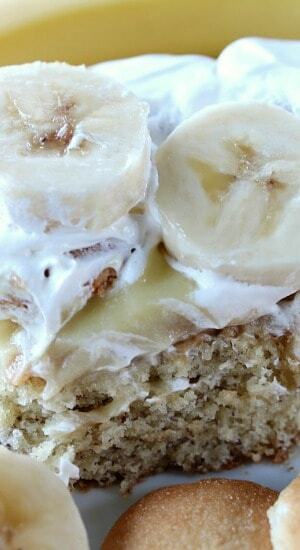 This so yummy best banana cake I have ever had! 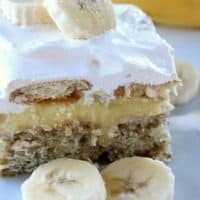 I love anything with bananas. This looks delicious, Terri.